From its launch in the Meralco Multi-Purpose Hall, through the games and upto the finals in PhilSports Arena (formerly Ultra), we witnessed this highly reputable amateur basketball league. 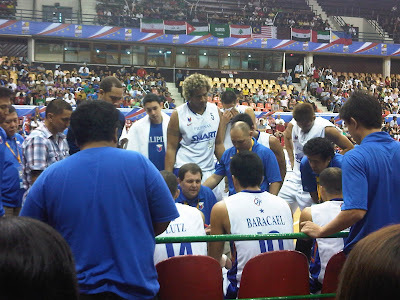 Smart Gilas Philippines indeed fought hard to be this season's champions; they were unbeatable until they were defeated by Iran, which put them out of the finals. They battled against Qatar for 3rd place, yet they lost. But still, Team Philippines was happy because 4th was the farthest they've reached in their FIBA history, not really bad! Great job by Samahang Basketbol ng Pilipinas (SBP) for staging this event. TV5 launched its newest sports channel -- AKTV on IBC13.For me, it's great to have a local sports channel which keeps you updated about the latest in the world of Sports, and also encourages other people who are not so into sports to at least appreciate it. I didn't actually run, but I was there for our corporate booth. It's ok to be SECOND. PLDT-Smart launches the JUMP Experience Center! MVP Bossing Award is Back!